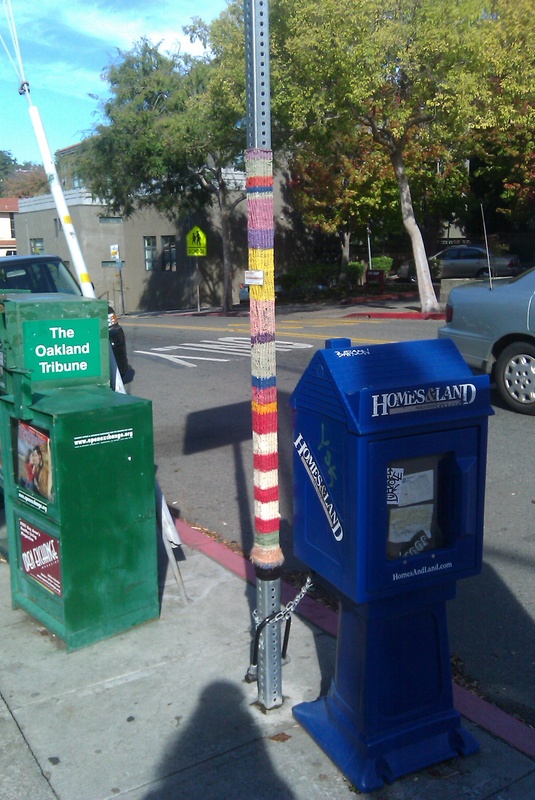 A yarn bombing. I’ve seen them online, but never in real life before. A couple of days later I saw a thorough yarn bombing at Cal’s campus. In Golden Bear Blue and Gold, of course. Unfortunately, I didn’t have my camera on me. The bombing on Solano kindly had a sign on it directing me to this blog. Some awesome (and international!) yarn bombings. It makes me want to knit up a little something and sew it to a pole in the my neighborhood. Have you ever seen a real life yarn bombing? Performed one? This entry was posted in yarn bombing. Bookmark the permalink.